This year the Walibi Aquitaine celebrates its 10th anniversary. 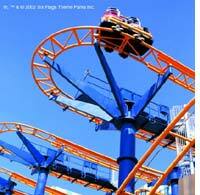 In order to mark the occasion, the park is inaugurating Zig Zag, a roller coaster similar to "Crazy Mouse". That is: small cars with no more than four people that follow, as it happens, a zigzag path. The interest on this type of coaster is not speed (40 km/h), but rather the syncopated rhythm (the changes are very fast) and the feeling that your car is about to crash into the décor any moment. In general, it is a lot of fun and accessible to most everyone. Zig Zag, which is made by the constructor Zamperia, covers 220 metres with changes in height of 11.5 metres.